Treasure Chest - a voice of New Life Church in West Linn, Oregon: New Life Heros! Last night at New Life Robinwood we had a meeting to talk about how we can continue to accomplish our vision of taking the new life of Jesus Christ to the Robinwood neighborhood of West Linn. 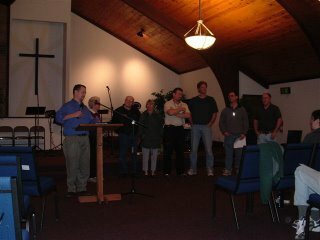 The folks in this picture showed up thinking we were going to have a discussion about building maintenance. We did have that discussion. We discussed how thankful we were to them for all of their hard work over the last several months. Those recognized were (from left to right): Eleanora Larson (spends more time at New Life Robinwood than Pastor Nathan :) ), Bob and Barbara Montgomery (serve as volunteer janitors, do routine maintenance, and whatever else needs done), Lee Bennett (has done so much over the last year not the least of which is lay carpet at Robinwood- 3 times! ), Ken Weiss (He and Joanne have done so much in the last year that to list it all would require a whole seperate post. We honored them with a night at Skamania Lodge), Mark Rainey (has fixed our H-VAC system more times than I care to mention, put in dropped ceiling, fixed exit signs, brought friends to help, and thrown out his back more the once for the sake of the cause), and Merle Ross (has helped a ton through the flooding issues of the last several months). Larry Latimer is not pictured, but he was also honored for a lot of carpet laying work in recent days. When you see these folks, give them a big thank you! Thank you all. Be assured your labor is not in vain! I wish I had been there for the 'ceremony'.